Has to be said that the management of Whittlecreek and Eaton St Torpid Heritage Railway are not overly-versed in the history of railways. So only after Whittlecreek and Eaton St Torpid Heritage Railway was underway did the relevance of Colonel Holman Fred Stephens (1868–1931; known to friends as 'Holly') come to the fore. Not that the management had never heard of him, just that they'd not put together the 'bigger picture' of his involvement in light railways. At the age of just 13, Stephens began an apprenticeship in the workshops of the Metropolitan Railway. Afterwards he was an assistant engineer during the building of the Cranbrook and Paddock Wood Railway, which opened in 1892. After 1894 he was qualified to design and build railways in his own right and found his life-long vocations when the Light Railways Act was passed in 1896. He had already built two railways before 1896 (the Rye and Camber Tramway and the Hundred of Manhood and Selsey Tramway). His first light railway, by the definitions of the Act, was the Rother Valley Railway, later to be the Kent and East Sussex Railway. In total, Stephens built sixteen railways, all on low budgets and with a variety of idiosyncrasies. Interestingly, many of these railways stayed independent of the regional companies formed by the Railways Act 1921. There is a Colonel Stephens Society, with considerable information about Stephens himself (including why he was a Colonel) and his railways and rolling stock. There's also a museum devoted to his memory and memorabilia. The Sussex Industrial Archaeological Society has a page about Stephens' earliest two railways. child's pull-along toy when seen alongside a 'real' locomotive. Awareness of Col Stephens came when researching the activities of two traction engine manufacturers in King's Lynn, Alfred Dodman & Co and Savage Brothers. Savage's became best-known for producing fairground rides. Dodmans had considerable experience with road traction engines and occasionally repaired shunting engines for local companies. 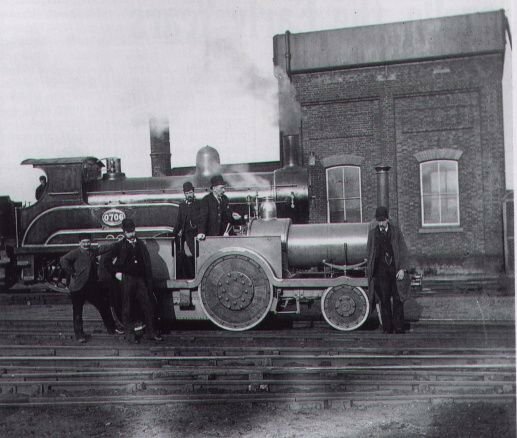 In 1893 Dodmans built what seems to have been the only railway locomotive manufactured in Norfolk. Advice was sought from a Mr S. Stone at the Great Eastern Railway's Stratford locomotive works, while the details, apart from the wheels, were worked out by Mr Dodman himself, who made use of traction engine components wherever possible. The result was Gazelle, a very small locomotive, often described as a toy, model or miniature engine. 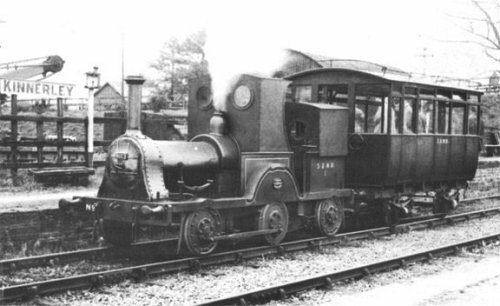 It is probably the smallest surviving standard gauge locomotive (although the locomotives constructed for the Rainhill Trials in 1829 were mostly smaller still). Gazelle's original configuration was 2-2-2 well tank, constructed with composite Mansell wheels of teak and steel. Gazelle was used by its owner, Norfolk businessman William Burkett, for his personal travel on the Midland and Great Northern Joint Railway as well as on the Great Eastern Railway. The furthest it seems to have travelled was Chesterfield. Gazelle after rebuilding to 0-4-2 configuration, with the repurposed tram. The cramped 'dog kennel' arrangement at the back of the cab is to protect about four passengers from the worst of the weather. In 1911, after what seems to have been an extended period without use, Gazelle was acquired by Colonel Stephens to use as an inspection vehicle on the about-to-be-reopened Shropshire and Montgomeryshire Railway. It was rebuilt, probably by W.G. Bagnall Ltd, as an 0-4-2 (retaining Mansell wheels on the rear axle only). With a horse tram hitched on the back (see photo above) Gazelle provided the passenger service on the little-used Criggion branch. Gazelle and the tram were withdrawn from service around 1930. However in 1937 Gazelle resumed inspection duties. The Army commandered the Shropshire & Montgomeryshire Railway in 1941 and Gazelle continued in use for inspections. When withdrawn in 1943 the idiosycnratic design of the locomotive led to the army keeping her as a showpiece. After nationalisation Gazelle was loaned by British Railways to the War Department and displayed on a plinth at the Longmoor Military Railway in Hampshire. Gazelle transferred to the care of the National Railway Museum in 1970 and, after a short period at York, was loaned to the Museum of Army Transport at Beverley. This closed in 1997, whereupon Gazelle was loaned to the Colonel Stephens Museum at Tenterden were she remains on display. The Colonel Stephens' Society have a lengthy article about Gazelle. The wonderful Eric Tonks (it's a small world – the management of Whittlecreek and Eaton St Torpid Heritage Railway went to junior school with his son) wrote a fascinating article about Gazelle for the Industrial Railway Society. Lots more photos of Gazelle. As Gazelle was made in King's Lynn then, in all probability, she was trialled then used by William Burkett on the King's Lynn to Hunstanton line, and maybe along the West Norfolk Junction Railway too. Both Stephens and Gazelle embody much of the spirit of Whittlecreek and Eaton St Torpid Heritage Railway. The management have an Emett-inspired vehicle in mind which would happily evoke some of the distinctive features of Gazelle. But it's a long way down the job list.